4 Hugues Ross - Blog: Chainsaw Deathrace Design #3: Speak up! Wow! My last few posts were kinda depressing. Let's brighten things up with a two post day: Design post now, status update later. Enjoy! So, this also has nothing to do with speed. That's because I'm currently rethinking how I want to handle that. Let's instead talk about a new feature that I want to implement: Sound. Let's pretend that the Killer's sound reaches ??? with a strength of 400, and Billy's sound is 155. 1. 400 is highest, so we halve it to get 200. 2. Since Billy's sound, 155 is less than 200, it is drowned out. 3. ??? hears the Killer quite clearly, but that's it. But what if Billy's sound was 255? 2. Billy's sound is now higher than 200, so it stays. 3. We take half of 200, 100, then subtract that from Billy's sound. 4. ??? 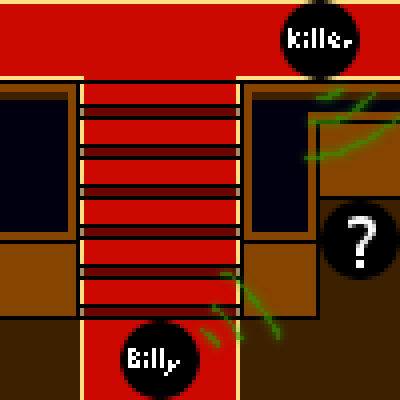 hears the killer's chainsaw with a strength of 400, and Billy's trip down the stairs with strength 155. It now knows where Billy is, and probably goes in to attack. Billy crawls off to the left. I hope this post wasn't too confusing. The next design post will probably be what I wanted to write about before. Later today, I'll be posting a quick update on what I've actually gotten done.